Why Laem Sor Pagoda is special ? Laem Sor Pagoda is located in the South Western part of Koh Samui very to close Bang Kao village. 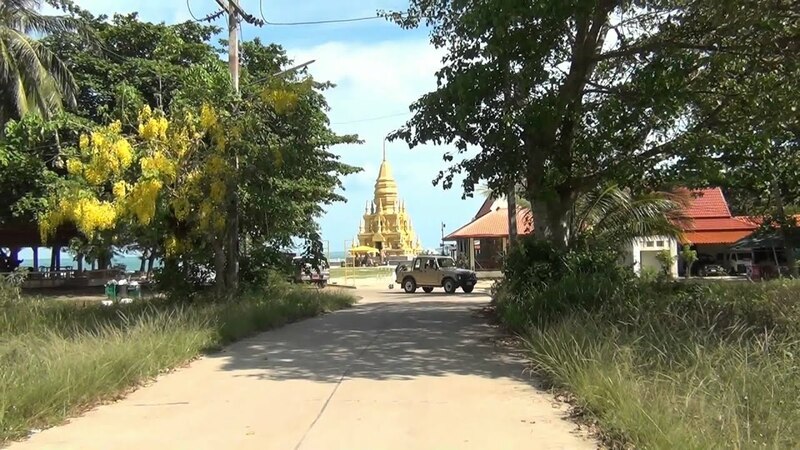 If you follow Route 4170 past the village Baan Bang Kao you will see the road become a smaller road this road leads to the beach which is where the pagoda proudly sits. Quick word, as with all Buddhist temples shrines and the like, it is important not to disrespect these places of worship, so pleased dress appropriately. Thai’s are very tolerant people and will forgive small faux pas. However, giving a monk a knuckle rub on his head is a big no no. Laem Sor Pagoda or Chedi laem Sor is it is also known locally as, is a fully operational temple, where people come to worship. The temple itself shines like a golden beacon from a distance, the temple is not made from gold, but instead, bright yellow tiles were used in its construction, giving it this glow. Set close to the beach and the azure waters of Samui, give it an even more beautiful appearance when the sun is shining brightly. What to explore at Laem Sor Pagoda? The entrance to the Pagoda is closely guarded by to huge giant statues both of these statues are holding large swords and will slay anyone that is offensive, and behind these two colossus stands a beautiful coloured image of Buddha. Further along the road you will find a a building named the boat hut and inside here you will find a wax figure of the monk who built the temple, he sits proudly in a small boat, all this is very visible through the large glass windows. The monk is highly revered by the locals, many come here to pray directly to him, you can purchase a small boat yourself from the store nearby and make a wish or say a pray and place the boat inside the building. There is a small forest with a lake very close by, and there are tables and chairs where you can sit relax and maybe even eat a small snack, a small solace form the midday sun. Part of this temple complex just up the hill from there lays another pagoda called Khao Chedi. This temple is white it is a little further up the hill and does involve some walking, but once up there you will witness some very stunning views of the area so best take a camera. Being located on a beach Laem Sor Pagoda means that you can visit any time and there are no fees to enter, but you can make small donations if you like. Obviously during daylight the pagoda looks at its best with its beautiful golden hue. Koh Samui is a beautiful Island with some dramatic views, and the drive down to see the Pagoda here is no exception. There is no doubt that this is a very special shrine and well worth the visit. Also worth a visit is Wat Khunaram and Big Buddha too. How to get to Laem Sor Pagoda? 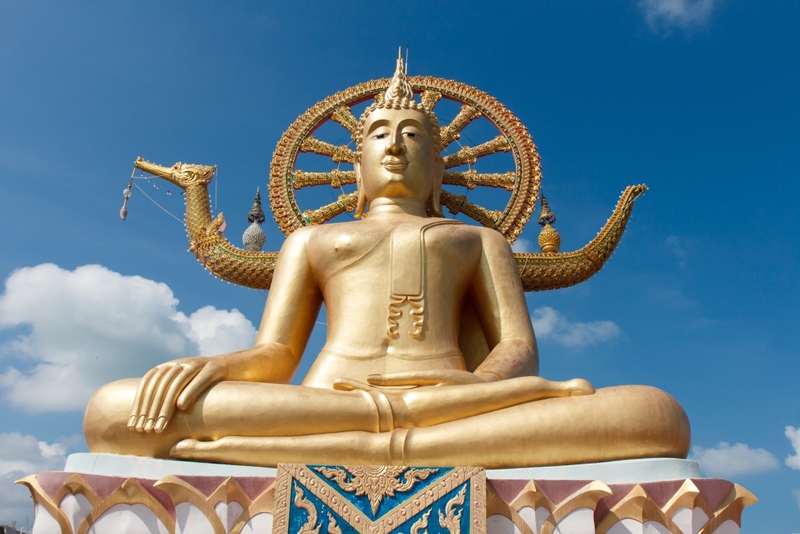 The Laem Sor Pagoda is located in the South Western corner of Koh Samui close to Bang Kao village. Following the main road, Route 4170, just past the village of Baan Bang Kao there is a turn to a smaller road leading to the beach where the pagoda is. This location is relatively far away from the beach resorts on the Eastern side of the island. The best way to get there would be by taxi. Make sure the driver turns on the meter or agree on the price before leaving. If you book a return trip, the driver will wait for you. Are you planning a trip to Ko Samui? Check out popular trips from our experts. Copy and make it to your own plan. Customize it Now! Plan a trip to Ko Samui based on your personalized interests. Please dress appropriately, no revealing clothes like beachwear. This is a great photo opportunity as there is absolutely nothing obstructing your view. On Buddhist holidays it can get busy when local people come here to make merit and pay respect to the Buddha. As the Laem Sor Pagoda is located on a public beach, you can visit any time. During sunlight hours the pagoda looks at its best with its beautiful golden glow. Laem Sor Pagoda is often overlooked due to it more remote location but still well worth a trip out to see.